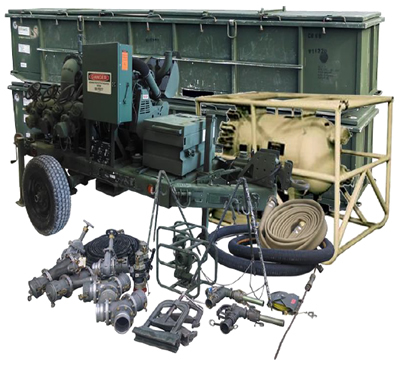 The primary purpose of the Tactical Airfield Fuel Dispensing System is used for receiving, storing and dispensing fuel in support of expeditionary airfields. With the single fuel on the battlefield concept, the system will be able to supply fuel to both aviation and ground assets. The system has a storage capacity of 320000 gallons and a pump capability up to 600 GPM. The system has 12 aircraft dispensing points for multi-aircraft refueling and the capability to receive fuel from multiple sources. Can be deployed as a complete system or tailored to meet specific mission requirements. Forklift support is required.